In a free, public event, renowned psychedelic poster artist, hand letterer, underground cartoonist and Cooper Union graduate Victor Moscoso A'57 will discuss his work with design historian Norman Hathaway. Moscoso will show examples and discuss his wildly influential methodology, which focuses on negative space, confusing-with-color and the boundaries of legibility, along with his days working in San Francisco during the hippie heyday, interactions with musicians and fly-by-night promoters, his working processes and how artwork was prepared for reproduction. Regarded as one of the foremost graphic artists of the 20th century, Moscoso's work is in the collections of The Louvre, The Museum of Modern Art, The Tate Modern, The Whitney Museum of American Art and others. Victor Moscoso is one of the premier artists of the psychedelic era. Raised in Brooklyn, he attended both Cooper Union and Yale (where he studied with Joseph Albers) before moving to San Francisco in the late 1950s. There he became a primary architect of the burgeoning underground hothouse that would produce brilliant posters, comic books, and album covers. Moscoso’s facility with color relationships and his remarkable ability to seamlessly blend images and lettering into a single entity was used to create a series of groundbreaking concert posters that propelled him to international fame. His posters feature dizzying hand lettering that push the very limits of negative space, and fierce battles between foreground and background. Along with Robert Crumb he was a founding member of the groundbreaking underground comic Zap Comix. 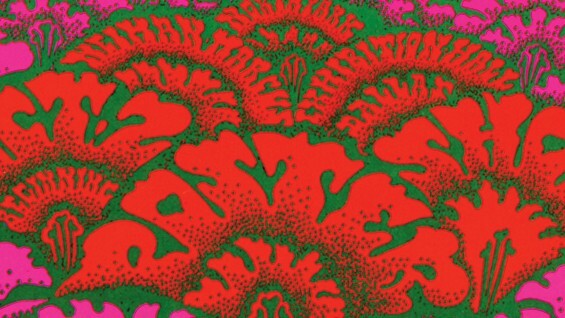 Moscoso also designed numerous album covers for Jerry Garcia, Herbie Hancock and others. Norman Hathaway is an art director and design historian. He is the author of Overspray and co-author with Dan Nadel of Electrical Banana: Masters of Psychedelic Art and Dorothy and Otis: Designing the American Dream. He has led creative initiatives for institutions including The Design Museum, London and the Royal Academy of Arts, as well as artists including Paul McCartney. He has taught widely on the history of design and typography for the London College of Printing, The Royal College of Art, and Goldsmiths College. Victor Moscoso and Norman Hathaway appear as part of the Herb Lubalin Lecture Series of Type@Cooper. The series is sponsored by the Herb Lubalin Study Center of Design and Typography at The Cooper Union, a public graphic design archive which places emphasis on a hands-on access to a wide range of design and typography ephemera.